It isn't just the largest ship we've ever made. It's probably the largest ship you'll ever want to buy. Tanker. And while there are larger ones, we can give you a very good reason for buying this "smaller" one. The maximum draft of the Olympic Bond is just 21 meters. So it can pass through shallow waters like the Malacca Straits and the Euro-Port. Larger tankers can't. 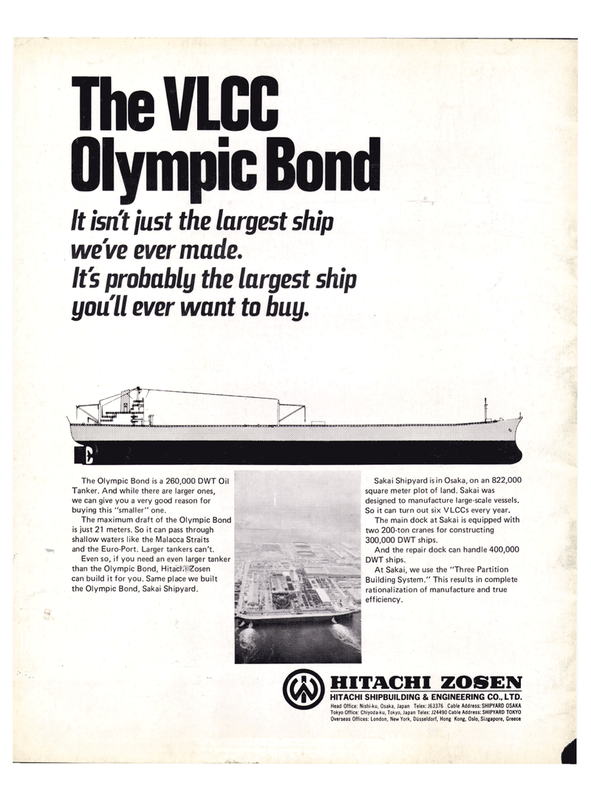 Even so, if you need an even larger tanker than the Olympic Bond, Hitachi Zosen can build it for you. Same place we built the Olympic Bond, Sakai Shipyard. Sakai Shipyard is in Osaka, on an 822,000 square meter plot of land. Sakai was designed to manufacture large-scale vessels. So it can turn out six VLCCs every year. The main dock at Sakai is equipped with two 200-ton cranes for constructing 300,000 DWT ships. Building System." This results in complete rationalization of manufacture and true efficiency.